Luton will be promoted as a film location after a decision to pay a company to showcase the town. The borough council's executive agreed to enter a two-year "low risk project" with the Luton On Film Limited at a meeting on Monday. The firm will receive 35% of any filming fee with the council getting the rest. "We know there is interest, but we don't have the opportunity to promote it," said council leader Hazel Simmons. "We've got some wonderful older buildings that might be useable for film opportunities. It's a low risk so let's give it a go." The Bedfordshire authority said it received just over £800 from filming in 2016-17 and income so far this year totals just over £500. 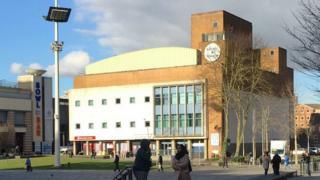 A council report says that Luton On Film would only need to generate £1,600 a year for the council to maintain its current income level and any increase would result in a net profit. If the company made no bookings the loss would not exceed £350 a year, the report added. However Conservative opposition leader Mike Garrett said the move was "not for the best of the public". "I've got a lot better ideas of spending money than going down this road." he told BBC Three Counties Radio.